The main reason for people to opt for artificial teeth or dental implants is to get back their confident smiles. Though the traditional methods were enough to fill the void spaces in your oral cavity, they failed to bring a confident smile on your face due to the metallic finish. One of the recent innovations is dental zirconia implants, bridges and crowns, which use ceramic in place of the titanium metal, and have been highly successful in bringing back the smiles in thousands of individuals without any aesthetic compromise. Zirconia implants or ceramic implants are those that are fabricated from zirconium oxide, which is one of the very few choices of materials that would integrate well with the jawbone and has biological compatibility. Though zirconia belongs to the family of titanium, it seems to be an ideal choice because of the color similarity it has with your original teeth. After the success of the prototypes of zirconium implants in the year 2000, the popularity of dental zirconia implants has increased by leaps and bounds. No wonder that individuals from all over the world are opting for them to bring back their original smiles. 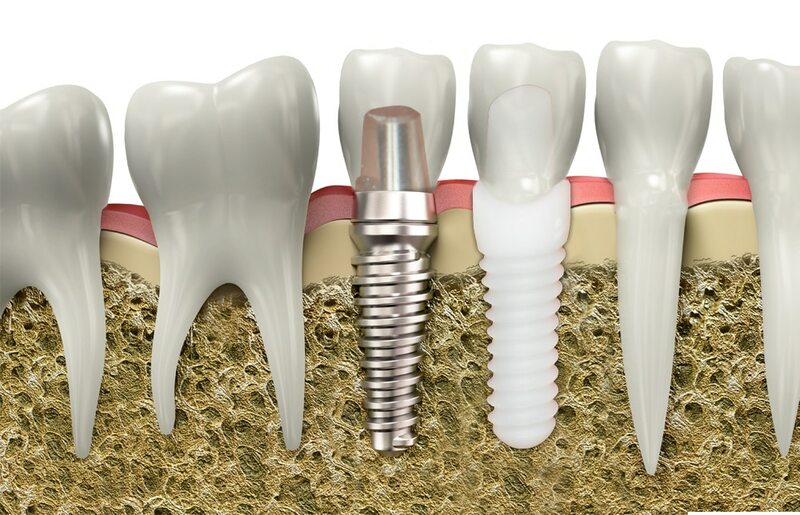 Why is Zirconia Implant better than the Titanium Implant? The recent improvisations in zirconia implants have resulted in the success of one-piece implants that come with more flexibility and lesser inflammation. The single piece implant includes the anchor that slides in the bone, which indicates that the entire process requires just one operative procedure unlike the conventional titanium methods. Most patients with gum recession due to age and other reasons opt for zirconia implants with a base color that mimics the natural look and blends with the rest of the teeth. This in turn enhances their smile and makes it look natural. You gain more confidence not with just the natural color of your restored tooth but also with the realization that there is a soft layer of tissue that grows around the implant, as it would happen with a normal tooth. This reveals the fact that zirconia implants benefit your gums around the lost tooth and help retain oral health. As a biocompatible metal, zirconia resists chemical corrosion and is a non-conductor of heat and electricity. This non-corrosive nature supports you in maintaining your oral hygiene. There is a rare possibility of the titanium implant causing allergic reactions due to its sensitivity to metals. However, a dental zirconia implant is completely bio-inert and hence absolutely free from causing any allergy in your body or oral cavity. Knowing all these facts would obviously encourage everyone to opt for a zirconia implant, especially those looking to sport a confident smile on their face. Previous articleThyroid Surgery without a Scar!